Carrie Dyson says both she and her husband are lucky to be alive after a “horrifying” close encounter with a polar bear at their cabin near Black Tickle, Labrador. They were sitting down to breakfast at their summer home in Batteau, when Dyson’s husband spotted two polar bears prowling around their friend’s cabin nearby, one at the door and the other looking in the windows. Dyson’s husband took off on his snowmobile, and the noise scared the animals off. “He came home and got the gun, and brought it into the cabin where we were to, just in case, because you don’t know,” she said. It’s a good thing he did. About 30 minutes later, there was a polar bear at Dyson’s cabin. “And I tell you, he wasn’t a very nice bear,” she said. The couple banged on the windows and doors to try to startle the animal, but the bear wouldn’t budge. Instead, it just continued to stare at them. 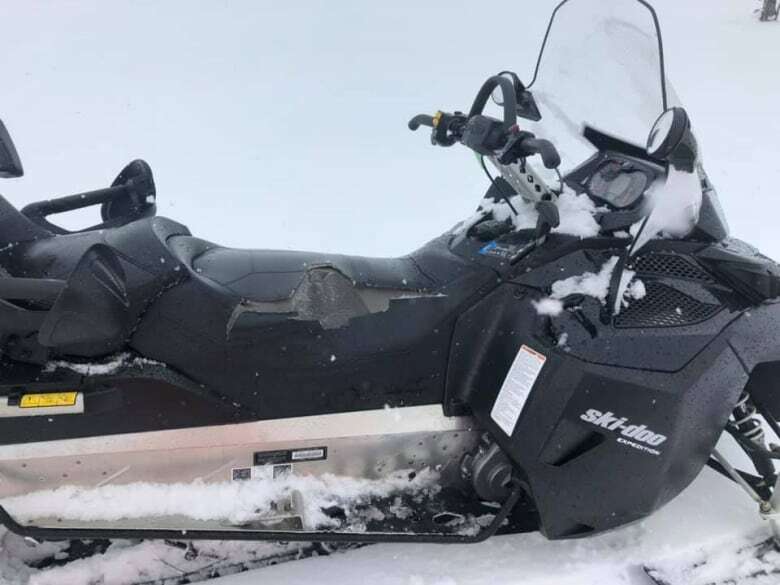 At one point, the bear — which Dyson described as aggressive — took a chunk out of her snowmobile, parked out back of the cabin. “Just one smack with his teeth like that, and the piece was gone out of my seat,” she said. Dyson was scared — “It was horrifying,” she said — and she could hear the fear in her husband’s voice as he tried to calm her down. He fired off four gunshots into the air, but the bear still wouldn’t move. Meanwhile, the Dysons were down to two shotgun shells and a tough choice. “He said y’know I don’t want to shoot off no more cartridges, try to frighten it away, when it’s not going to go,” Dyson told CBC Newfoundland Morning. Thankfully, Dyson said, it didn’t come to that. The couple put in a call to the same neighbours who own the cabin where the bears were first spotted, and told them about their panicked situation. Dyson said the neighbours were able to drive the bear away, and Dyson and her husband went across the harbour to meet some friends. “I was crying all the way home,” she said, adding her neighbours told her the determined bear came back for another visit while they were gone. It’s not unusual to see polar bears in the area, Dyson said, but they usually just pass through without bothering anyone. This time, they saw four within an hour, and Dyson said some of them were acting aggressive. Dyson’s husband had never seen a polar bear act like this before, and Dyson said it’s changed his perspective on the animals. In the meantime, Dyson said she still see the eyes of the polar bear staring her down. “It might be days before I can get it out of my eyes,” she said.